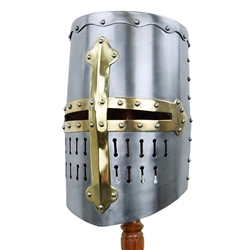 This 13th Century Great Helm is constructed from 16 gauge steel and adorned with a riveted brass cross. The blackened inside of the helmet is lined with an adjustable leather suspension liner. The helm is finished with a leather chin strap with an antiqued brass buckle.